Most people who come to the festival are surprised by how easy it is to park close to the event! The entire festival footprint is contained in Peoples Natural Gas Park this year. Parking will be available for $5 in the Conemaugh “I” lots across from the train station — a portion of the proceeds will benefit local non-profit organizations! 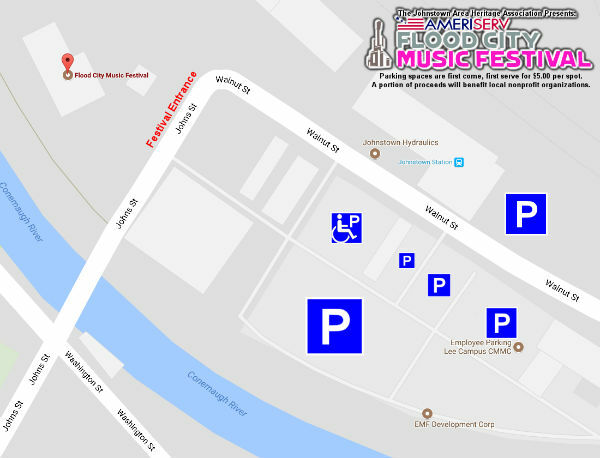 To access these lots, please approach the festival over the Walnut Street Bridge. CamTran typically extends Inclined Plane hours during the festival. We will post 2019 hours when they are made available. A limited amount of handicapped parking is available in the Conemaugh “I” lots, across the street from the train station. You must have a valid handicapped tag to use this parking. Please approach over the Walnut Street Bridge. Ample parking is available downtown in city-owned garages, and the city may charge to park in these garages. To locate these garages from the downtown area, look for permanent blue wayfinding signs posted throughout downtown. In addition, a limited amount of free street parking is available. Watch carefully for the many pedestrians making their way to festival grounds. Please visit this page for parking for non-festival events at Peoples Natural Gas Park.